As the name suggests, this is simply a Waltz with a leap rather than a step on counts 1 and 4. You land, downward, on counts 1 and 4, finishing the leap on these counts, not airborne. Keep all of the other counts the same (i.e., one leap and two smooth steps, rather than three leaps). The feet touch the floor in the same places at the same times, you simply leap slightly before counts 1 and 4, landing on those counts. Waltz music, perhaps with an accented downbeat. This is an old Waltz, lately revived in Paris. 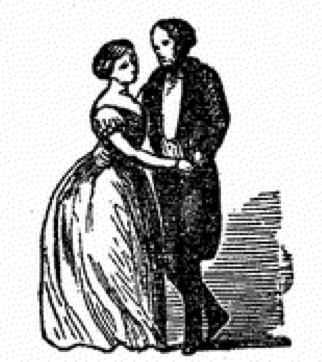 The step is similar to that of the common waltz, except that the first step must be jumped, like a jetté [sic], and the other two steps run. N. B. The steps of the Sauteuse are sometimes confounded with the second step of the Schottisch; care should be taken not to fall into this error, as it would quite destroy the original character of the dance.